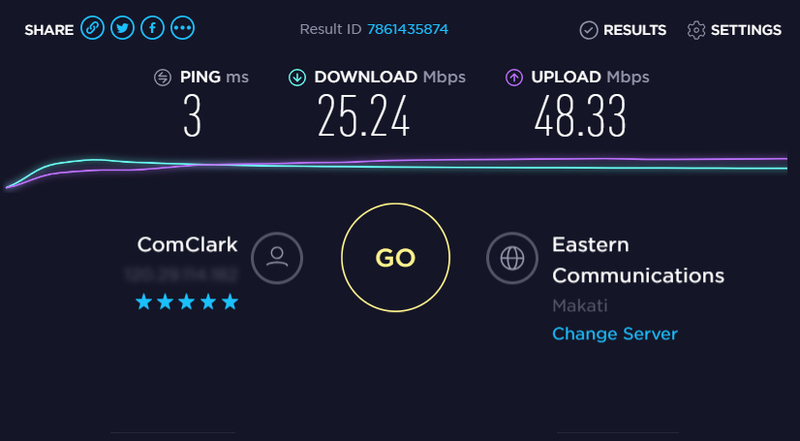 During the 3rd week of November 2018, I finally decided to sign up for a Converge Fiber X subscription to supplement the internet speeds that we have here at home. I signed up for Converge Fiber X Plan 1500 with 25 Mbps Download and Upload Speeds through an authorized agent who was going around our barangay here in Tondo, Manila. It took Converge only around a week to process my application, to install the line and equipment, and to activate my account. Frankly, I was pleasantly surprised at how fast the whole thing went. Side Note: After successfully signing up via the agent, he asked to pay PHP 1,500 to Converge via Cebuana Lhuillier as installation fee. For those who are also residing in this area and are wondering just how fast and reliable Converge's Fiber connection is, here are the results that I got when I ran Speedtest by Ookla on my Plan 1500. Needless to say, my upload speeds are through the roof! I often get more than double the promised speeds, which will definitely help me to share my video content faster on Youtube. Sometimes, I get download speeds that are just wee bit slower than what's promised. To be specific, there are times when I only around 23 to 24 Mbps instead of 25 Mbps. But honestly, at this point, it's hardly noticeable. So there you go. Let me know if you questions about Converge Fiber X through the comment section below or by messaging me on Facebook, Twitter, or Instagram. Cheers! Kindly note that I am not promoting Converge Fiber X as an internet provider. I'm just sharing my experience as one of their many new subscribers here in Tondo, Metro Manila.